On 7th May 2005 (from 10:00am to 10:00 pm) in Warsaw’s Wola, in the Sowiński park, the first edition of the event “Warsaw Challenge” was held. The whole event commemorated Artur Zalewski. In 8vs8 tournament 15 teams from Poland and one from Ukraine competed for the prize of 3000 PLN. The championship was led by MC Kfiat i MC Rufin while DJ Spike and DJ Ojciec Karol provided musical setting. 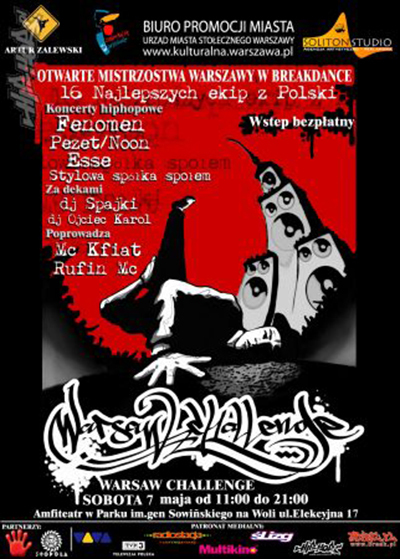 During the eliminations and at the final battle hip-hop bands: ” Esse “, „Stylowa Spółka Społem”, „Pezet & Noon”, „Fenomen” gave concerts. The event was accompanied by: graffiti jam, in which one of the work was dedicated to the memory of Arthur Zalewski as well as skating shows on a large ramp. “After party ” organized by Michał Pełka and Piotr Zaczyński took place in LIVE club at Polna Street and it was recognized by the guests and the media as the best party ever held in this venue. The park and amphitheater, the main scene of ” Warsaw Challenge ” were visited by about 4,000 people. Admission was free thanks to financial aid of Promotion Office of the Capital City Warsaw. Awards were funded by HEYAH. The media patrons were: TVP3 , Viva TV , Radiostacja, Multikino, www.break.pl and www.hiphop.pl. In the opinion of the players, the public and the media event was rated very highly. Thus, through one man love to dance, the assistance provided by many of his friends, companies and the Office of Warsaw, the first edition of the event Warsaw Challenge was held.